Vesicles, fluid-filled sacs that brain cells make to trap amyloid, a hallmark of Alzheimer's, appear to also contribute to the disease, scientists report. Reducing the production of these vesicles, called exosomes, could help reduce the amount of amyloid and lipid that accumulates, slow disease progression and help protect cognition, scientists at the Medical College of Georgia at Augusta University report in The Journal of Neuroscience. When confronted with amyloid, astrocytes, plentiful brain cells that support neurons, start making exosomes, to capture and neutralize it, said Dr. Erhard Bieberich, neuroscientist in the MCG Department of Neuroscience and Regenerative Medicine and the study's corresponding author. "If you swarm astrocytes with amyloid, you trigger an aggressive response," he said. Happy astrocytes, on the other hand, don't make exosomes. Not unlike a landfill, the real problems begin when the biological sacs get piled too high. In such volume and close proximity to neurons, exosomes begin to interfere with communication and nutrition, neurons stop functioning well and eventually begin to die, a scenario that fits with disease progression, Bieberich said. MCG scientists followed the process in an animal model with several genetic mutations found in types of Alzheimer's that tend to run in families and make brain plaques early in life. One mouse group also was genetically programmed to make a nonfunctional form of the enzyme neutral sphingomyelinase-2. Amyloid also activates this enzyme, which converts another lipid, called sphingomyelin, into ceramide, a component of the brain cell membrane known to be significantly elevated in Alzheimer's. In fact, with disease, the brain has two to three times more of the lipid known for its skin-softening ability. The MCG scientists found exosomes made by astrocytes accelerated the formation of beta amyloid and blocked its clearance in their animal model of Alzheimer's. Male mice, which were also sphingomyelinase-deficient, developed fewer plaques and exosomes, produced less ceramide and performed better in cognitive testing. For reasons that are unclear, female mice did not reap similar benefits, said Bieberich, noting that Alzheimer's tends to be more aggressive in women. His earlier work has shown that female mice have higher levels of antibodies in response to the elevated ceramide levels that further contribute to the disease. His new work is the first evidence that mice whose brain cells don't make as many exosomes are somewhat protected from the excessive plaque accumulation that is the hallmark of Alzheimer's. It is also an indicator that drugs that inhibit exosome secretion may be an effective Alzheimer's therapy, Bieberich said. Current strategies to prevent plaque formation, have been unsuccessful, the researchers write. "We show clearly that sphingomyelinase is causative here in making ceramide, making exosomes and in making plaques," Bieberich said. 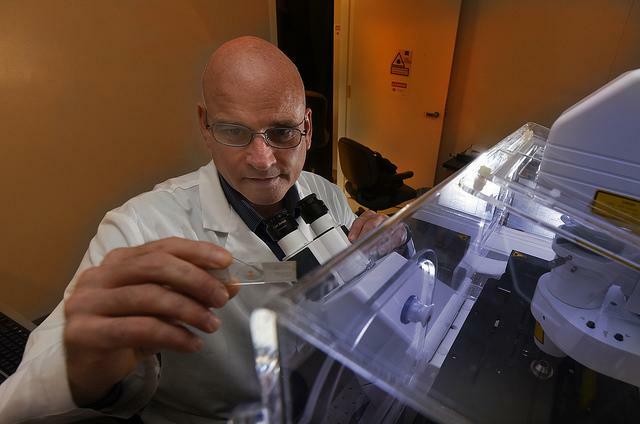 He and his teams already are testing different drugs given to patients for reasons other than Alzheimer's that may also inhibit sphingomyelinase and ultimately ceramide and exosome production. Inside the brain, ceramide is an important component of the cell membrane, but too much starts collecting in the exosomes, combining with the amyloid to form a disruptive and eventually deadly aggregate. In fact, MCG scientists could see the ceramide and amyloid clustered together in the brains of mice without sphingomyelinase suppression, further implicating a close association. In a scenario that seems to go full circle, Bieberich has mounting evidence that in Alzheimer's, there is a shorter, "bad" form of ceramide coating the antennae of astrocytes. Normally, antennae help astrocytes focus on taking care of neurons. But the shorter version that he believes contributes to disease has astrocytes giving up their caretaker role, spending their energy on themselves and starting to divide. Bieberich and his team already are looking for other exosome triggers such as inflammation-producing immune cells called cytokines as well as physical trauma. Ceramide levels have been proposed as an early Alzheimer's biomarker as has evidence of amyloid-positive exosomes in the blood.